Take on the roles of Rick, Morty, Zeep, and Kyle and introduce wondrous Power-making technology to the worlds you`ve created - then steal it for yourself! That is, if your opponents don`t get to it first! 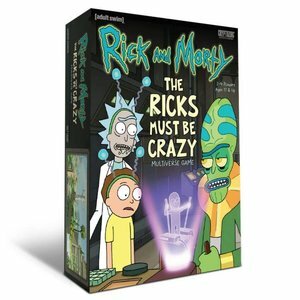 This engine-building game (of sorts) takes place in the four locations (`Verses) from the far-out Rick and Morty episode `The Ricks Must Be Crazy`: the Rickverse, Microverse, Miniverse, and Teenyverse. Due to time dilation and other pseudo-scientific malarkey, the lower you travel in the `Verses, the greater number of Actions you`ll have each round. But some of those lower `Verses are a bit primitive, so the Contraptions you build to use all that sweet Power might not work so well!